It is high time that we sang the praises of our largest and most long served client, Under Canvas, America’s premier glamping company. We have worked with Under Canvas since long before we became Apogii. We began working together at the beginning of both our respective businesses and our stories are entwined in that sense. The ethos of Under Canvas, their outlook on business and the positive impact it can have are inspiring. They have certainly inspired us. 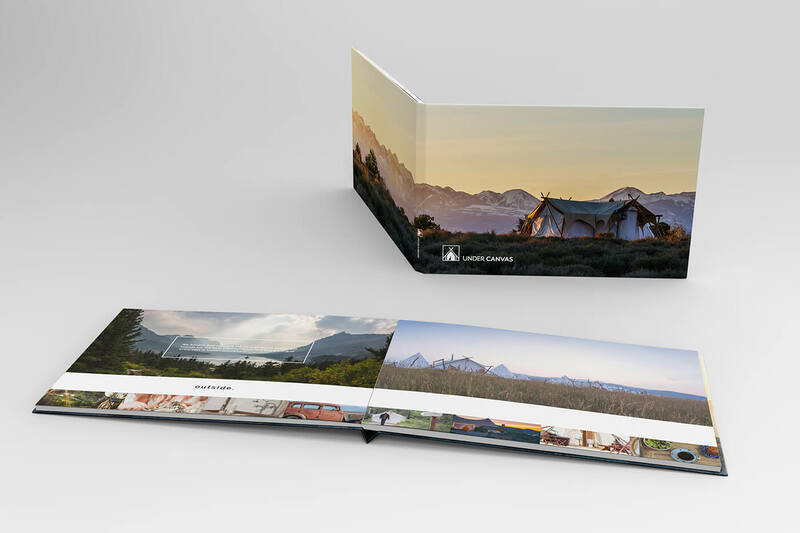 This pioneering company has an ethos as beautiful as their 4 current camp locations: Yellowstone National Park, Glacier National Park, Moab and Zion. Grand Canyon and Great Smoky Mountains camps are among those opening in 2018. These luxury camps allow the 21st century tourist direct access to ever growing, beautiful, adventurous locations. The camps themselves are designed to have as minimal impact on their environment as possible, in line with their ethos. For example, a whole camp with 100 people uses as much water and power as just one residential house. Co-founders Jake and Sarah Dusek continue to shape Under Canvas as it moves forward: Sarah as CEO, Jake as the mastermind behind their unique tent designs (manufactured in Montana, their home state). In addition to glamping and adventures, the company supply their unique tents for all manner of events in the US and Canada through Under Canvas Events. The tents themselves can be purchased for your own events through their subsidiary Jasper Madison. One of the more unique things we do for Under Canvas is crafting camp pre-opening illustrations (see image below and this example). These are useful in engaging the audience required prior to a camp actually being built. This audience can include investors, the media, tourism publications and travel companies as well as the public. They also keep us busy with creating brochures, sitemaps, restaurant branding, signage, printed marketing material of all types and lots of supporting material and ideas consultation. If you have visited our work pages, you will have seen some of the work that we have done for them. Under Canvas has recently been recognised as one of America’s fastest growing companies (Inc.com), with another 4 camps planned to open in 2018, growing to a total of 40 camps in the next 5 years. Their goal is to be the largest and most innovative glamping company. Prestigious clients of Under Canvas include Google, Facebook, Microsoft, Red Bull, Toyota, Free People, TOMS, Pottery Barn, Sunset Magazine, to name a few. 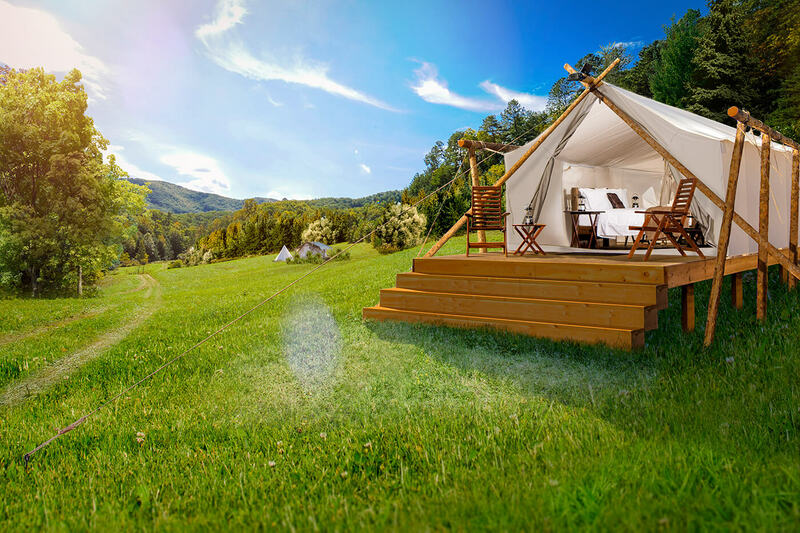 They are the glamping partner for The Outbound, a global adventures brand and are also in partnership with Casper, the mattress company, who has supplied all mattresses for their Zion camp. Under Canvas are also proud to be a member of Leave No Trace. They have a permanent staff of 20-25 and seasonal staff levels are at the time of writing (Summer 2017) are at a peak of 176 seasonal staff who run the camps. The media regularly feature Under Canvas’ achievements, style and locations. Outlets they have appeared in include (though are not limited to) the Today Show, Good Morning America, TIME Magazine, Vogue, New York Times, USA Today, Buzzfeed, Travel & Leisure and Inc.com where they made the “Inc 5000” list for America’s fastest growing companies at place 573. Additional media awards include Sunset Magazine’s Best Luxury Camping Award, 2016 Rocky Mountain Bride, Best in the West and the 2017 Allie Award Winner. Underlying their successes is a strong desire to see both their dreams and the dreams of others fulfilled. All the hard work is with a vision in mind: to bring the outdoors to those who most need it. Sarah fell in love with the safari experience whilst in Zimbabwe undertaking AIDS education. That experience was the spark that was fanned by Jake’s talent for sustainable design and led them towards creating a new way of sharing nature with people. Together they decided to create a glamping company that would serve as a bridge to the outdoors in a very unique way. We were there with them at the beginning: contributing to the practical build and visual design of Sage Safaris which birthed the Under Canvas brand in 2009. This was an all-inclusive Montana safari experience with bird hunting a big interest for many guests. Once Sage Safaris camp was underway, they looked at how to attract guests for longer periods of the summer season. This led to the creation of a larger camp that has the beautiful Yellowstone National Park on its doorstep with a wider variety of activities in place in the area. Yellowstone camp set the tone and scope for the next camps that were to open; each in a beautiful landscape (or national park) and built to be ecologically low impact. There being a wider purpose to having great camps, Sarah & Jake have found ways to give kids access to the outdoor experience. Nonprofits for disadvantaged children for example can apply for bookings at a moderated cost so they too can enjoy learning about nature, have campfires and play in the dirt. Sarah, Jake and their team are an inspiring group of people and thoroughly deserve their successes. It is our job to let the best of what they do be seen. We’re proud to be associated with such a brilliant organisation, its people and all that it does. Our stories are often entwined with our clients and this is more the case with Under Canvas whom we look forward to serving well into the future very much.